For West Virginians, coal mining is as much a part of our lives as the blood in our veins. Many of us grew up in towns with names like Coalwood, or Coalburg, or Coalton, or maybe it was along the banks of the Coal River. Where ever it was, you can be sure the local mine was probably the centerpiece of the community’s life — of your family’s life.As children, many of us would sit in the evening and watch for daddy’s truck to come bouncing up the hollow and we would sit at his feet as he took off his work boots at the end of the day. His calloused hands felt soft to the touch as you climbed up on his lap. Even though he was tired from a long shift, he always made you feel like he had been waiting all day to get the chance to play with you. Many of our miners followed our fathers and grandfathers and even great-grandfathers into the mines — proud to carry “papaw’s dinner bucket” with them as they went. Coal mining is the tie that binds our generations. It is our heritage and has shaped our culture. For the past decade, we have used the “Coal is West Virginia” jingle in our radio spots, but it is far more than a radio jingle. 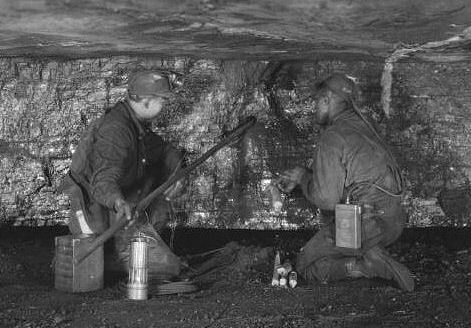 It reflects a very basic reality — West Virginia and coal mining are almost synonymous. It simply is who we are — whether we actually work in the coal mines today or walk the halls of the State Capitol, whether we drive a coal truck on a surface mine or teach at the local high school, we share in that heritage. It’s never been an easy job, but we have always taken a quiet pride in that. We have always thought of ourselves as just a little special. And we should, after all, it was through our work and that of our parents before us that our nation’s economy was built. Our coal made the steel and not only do we “keep the lights on …” we turned them on in the first place.. Our coal made the steel that built our railroads, our cars and the skyscrapers of Manhattan. Our coal was the basic feedstock of our nation’s chemical industry and it has provided us cheap, reliable electricity for the past 100 years. We look around at what our nation has become and we can say with pride … “WE BUILT THIS.” We have been there for our nation in times of peace and we have been the industrial backbone of our nation in times of war. Our coal has been used to build the ships and tanks and planes that have made our military second-to-none, have won our wars and afforded our soldiers, sailors and airmen the greatest protection possible. Our people have been proud to do so…When other industries stood in line for government assistance, we were mining coal. We have never asked for anything more than the right to do our jobs and provide for our families. We are proud of our heritage … we wear it as a badge of honor. Those orange mining stripes identify us as members of the family of coal– a family as tightly knit as any bound by blood. Yes, there are occasional disagreements. There is with any family. But when our family is threatened, when tragedies occur, we come together to defend our people, protect our way of life, comfort those who grieve and overcome whatever problems may arise. We stand together on the foundation laid by the generations who came before us … determined to make sure the lives of future generations’ are just that much better than our own. We stand together to build a future for ourselves, our children and our grandchildren. We owe them no less than what our parents gave us.